If you are interested in starting a teeth whitening program, contact Dr. Dana Walters in Hilliard and Upper Arlington, Ohio. 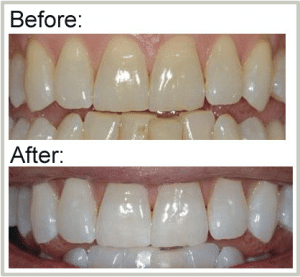 Your dentist can make trays that are specifically for your bite along with a peroxide solution. You apply the solution to the front teeth and wear the mouthguard tray for several minutes. This may take several applications to receive the desired whitening. These do not contain bleach, so they will not change the color of the teeth. The whitening product in the toothpaste can remove stains over time, such as coffee or wine.